Motorola which is now a Lenovo brand has announced the arrival of two new smartphones in the Indian market. The Moto Z and Moto Z Play will arrive in India on 17th October 2016. The highlight of these two smartphones is that they support modular accessories called Moto Mods. Moto Mods can be attached to any one of these two smartphones with the help of powerful magnets. Moto Mods accessories include JBL SoundBoost Speaker, Moto Insta-Share Projector, Hasselblad True Zoom Lens, Incipio offGRID Power Pack and Moto Style Shell. Their working is pretty self explanatory from their names. The Moto Z that costs Rs 39,999 has a 5.5inch AMOLED Quad HD (2560 x 1440 pixels) resolution display that is covered in Corning Gorilla Glass 3 and has a pixel density of 535ppi. Underneath the hood we have a Qualcomm Snapdragon 820 chipset with 1.8GHz quad-core CPU, Adreno 530 GPU and 4GB of LPDDR4 RAM. The internal memory of the Moto Z stands at 64GB and a microSD card slot takes care of additional storage. When it comes to photography the Moto Z has a 13MP OIS camera on the rear with dual LED flash and 5MP one on the front. The Moto Z has a fingerprint sensor on board. It is powered by a 2600mAh battery. 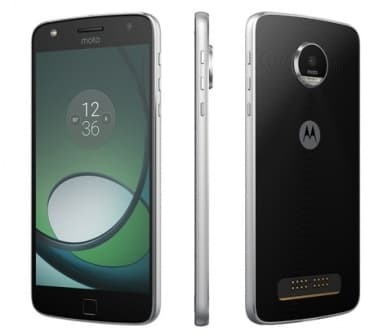 The Moto Z Play that is slightly cheaper at Rs.24,999 sports a 5.5inch display but with full HD (1080 x 1920) resolution and pixel density of 403ppi. Underneath we have a Qualcomm Snapdragon 625 chipset with 2GHz octa-core CPU, Adreno 506 GPU and 3GB of LPDDR3 RAM. The internal memory of the Moto Z Play stands at 32GB and a microSD card slot is duly included. 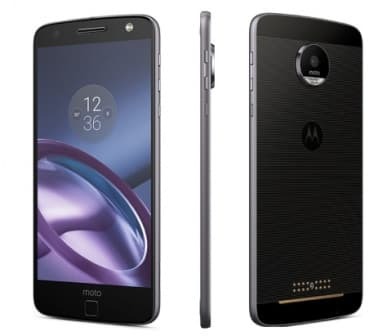 The Moto Z Play has a 16MP PDAF camera with dual LED flash on the rear and 5MP camera on the front. The Moto Z Play also features a fingerprint sensor. The Moto Z Play is powered by 3510mAh battery.